The North East Branch of the Victoria Police Blue Ribbon work alongside North East Health to assist in the creation of a Patient Rehabilitation Gymnasium. Using ground-breaking robotics technology this new facility assists in the physical rehabilitation of patients across a range of conditions and to also provide ongoing out-patient care after they have left hospital. It is recognized as the first unit of its kind in Australia and is now one of the leading robotic rehabilitation units in the World. 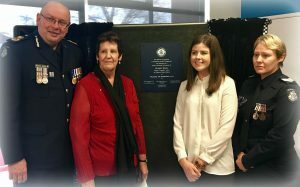 This project was dedicated as a Police Memorial to honour Senior Constable Rob Kerr (19607) of Chiltern Police Station who died from injuries he received when struck by a car while he was jogging. The driver of the offending vehicle failed to stop and render assistance, leaving S/C Kerr, badly injured, lying in a ditch. He later died in hospital. In addition to remembering S/C Kerr this memorial is also an acknowledgment of the dedicated service of all police members, present & past, who have served their communities from one-person stations. Transcript of a letter kindly supplied and shared by the Kerr family for the dedication of this memorial. BORN ON THE 24TH OF MAY, 1951. ROBERT LINDSAY KERR WAS THE FIRST BORN SON TO RONALD AND RUBY KERR OF RUTHERGLEN. ROB ATTENED RUTHERLGEN PRIMARY SCHOOL AND SECONDARY SCHOOL FROM 1956 – 1968. ROB WAS ALWAYS A HARD WORKER, LANDING HIS FIRST JOB PICKING GRAPES AT SEPPELTS WINERARY AS A YOUNG TEENAGER. AFTER YEAR 11 ROB STARTED WORKING AT THE ANZ BANK, REACHING UP TO THE POSITION OF AN ACCOUNTANT AFTER HE REALISED THAT PICKING GRAPES WAS NOT A GREAT FORTUNE FOR HIM. HE WORKED IN SERVEAL BRANCHES THROUGHOUT HIS CAREER, INCLUDING RUTHERGLEN, EUROA, BURWOOD, SEYMOUR AND ROCHESTER. THIS INCLUDED HITCH HIKING TO EUROA EVERY WEEK AND RETURNING HOME FRIDAYS TO VISIT HIS BELOVED PARENTS AND YOUNGER SIBLINGS, DAVID, COLIN, DES AND LYNNE. 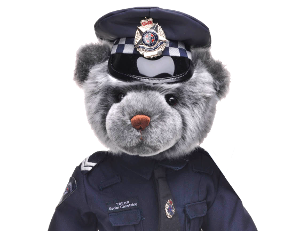 IN 1976 ROB DECIDED TO LEAVE THE BANK AND JOIN THE VICTORIAN POLICE FORCE WHERE HE EVENTUALLY COMPLETED OVER 28 YEARS OF SERVICE IN THE FORCE AND THE COMMUNITIES IN WHICH HE WORKED. WE ALL BELIEVED HIS ACHIEVEMENTS AND COMMITMENTS TO THE POLICE FORCE IS WHAT ELEVATED HIM TO THE HIGH LEVEL OF RESPECT HELD BY HIS FAMILY, HIS PEERS IN THE FORCE, HIS NUMEROUS FRIENDS AND THE COMMUNITY IN WHICH HE SERVED IN. ROB POSSESSED MANY GREAT QUALITIES – HE WAS STRONG IN CHARACTER, HE WAS INTELLEGENT, HIS MORALS AND ETHICS WERE OF THE HIGHEST LEVEL, HE WAS HIGHLY TRUSTWORTHY AND FIERCLY LOYAL TO HIS FAMILY AND FRIENDS. ROB HAD ALWAYS LOVED HIS HISTORY, RECOUNTING THE HISTORY OF THE KERR FAMILY SINCE THE FAMILIES GREAT, GREAT GRANDFATHER WHO MIGRATED FROM SCOTLAND IN THE MID 18OOS. THIS PROJECT SPANNED NEARLY THREE YEARS AND INVOLVED AN EGNORMOUS AMOUNT OF TIME AND RESEARCH. ROB ALSO SPENT TIME ON HIS OWN WRITINGS IN ‘REFLECTIONS OF A RUTHERGLEN LAD’ AMOUNG WITH OTHER TITLES SUCH AS ‘OUR ANGEL BELINDA’ IN WHICH HE WROTE AFTER LOSING HIS DAUGHTER BELINDA IN 1991 AFTER DROWNING IN THE FAMILIES BACKYARD SWIMMING POOL. ASIDE FROM HIS FAMILY, ROB ALSO HAD MANY OTHER INTERESTS, HE WAS A VERY KEEN BUSHMAN. HE ABSLUTLY LOVED BUSHWALKING AND HAD A VERY GOOD KNOWLEDGE OF THE LOCAL FLORA AND FAUNA. THERE WAS HARDLY A BIRD OR NATIVE AUSTRALIAN PLANT IN THIS DISTICT THAT HE COULD NOT IDENTIFY. ROB ASO LOVED HIS COD FISHING, DUCK SHOOTING AND FOX/ RABBIT SHOOTING, COLLECTING BIRD EGGS AND CHIPPING BARDI GRUBS. AS MANY OF YOU HERE CAN REMEMBER THE PERSON ROB WAS, HE WAS SIMPLY AMAZING. HE WAS A KIND, COMPASSOINATE AND GENEROUS MAN WHO CARED DEEPLY FOR HIS FAMILY AND FRIENDS. ROB TO THIS DAY IS ALWAYS REMEMBERED BY EVERYONE, STORIES ARE ALWAYS SHARED ABOUT ROB AND HOW HE USE TO MAKE US ALL LAUGH UNTIL WE WOULD CRY. HIS PRESENCE IS STILL MISSED IN EVERY FAMILY GATHERING, AND ALWAYS WILL BE. THE KERR FAMILY IS TRULY HUMBLE AND PROUD BY THIS INCREDIBLE HONOUR AND REMEMBRANCE OF THEIR BRAVE SON, BROTHER, UNCLE, FRIEND AND LASTLY, FATHER AND HUSBAND. WE THANK YOU ALL FOR COMING AND SHARING THIS SPECIAL MEMORIAL FOR OUR DEAR ROB.